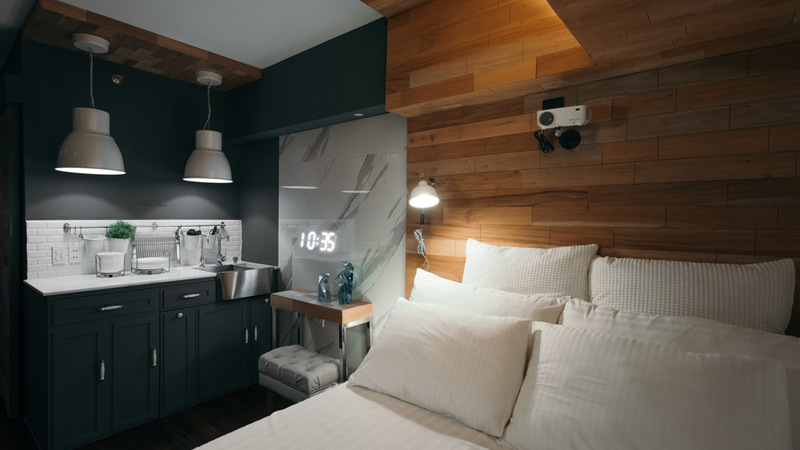 Small spaces continue to surprise us these days—with homes measuring 13sqm and a few units showcasing clever design hacks. Take for example this 18sqm studio unit in Quezon City—it has a plain door similar to other units in the building, but once you step inside, you’ll feel like you’ve been transported to an entirely different place. “I wanted a house that looks like a coffee shop—homey, cool, and nice. I needed a good place where I can work, think, and sleep,” shares Marlon, who spends most of his time at home and overseeing a couple of franchises around the Metro. To make the most of the available space, Marlon worked with two young and promising designers from the University of Santo Tomas. Bash Batara and Jolo Francisco conceptualized the unit’s overall look and worked on the architectural design and drawings. “The client wanted a home that has flexible spaces that’s similar to modern urban living seen in most Asian countries like Japan and Hong Kong that had transformable spaces that can be pushed and pulled. However, he also didn’t want to sacrifice the overall aesthetic and luxury of the design,” explains Bash. Prior to the renovation, Marlon only had a bed in the unit and a few essentials. Bash and Jolo asked him to live in the bare space for a week to help identify what he needs in the space. “Kaya sa final look, yung office natatago, yung kama laging andyan. Sleeping is one of the best things in life for me,” he quips. The designers also came up with a modern contemporary design complemented by classic touches to create a balanced look. “My friends often ask me why I chose to live in an 18sqm unit instead of staying in the family’s big house. I wanted to prove that you don’t really need big spaces to make a statement. This unit is cozy, elegant, and livable,” Marlon shares. A condo that leaves a lasting impression? This tiny home definitely fits the bill.